Any TV series that begins with a dog falling from the height of a skyscraper and lingers on the aftermath of the impact at ground level is not going to be one marked by subtlety. It’s that level of brutality, meted out for plenty of humans as well, that becomes one of the cornerstones of the new Netflix series “Sacred Games.” The first original for the service from India, the series follows the lives of two men in a pair of parallel timelines, feasting on the dire undercurrents of modern-day crime stories. Based on Vikram Chandra’s 2006 novel of the same name, “Sacred Games” begins as an investigation by a local by officer Sartaj Singh (Saif Ali Khan), who goes from investigating a robbery gone wrong to uncovering the engine behind a gigantic infrastructure of institutional corruption. Tracing a mysterious phone call, Sartaj eventually makes a fatal discovery that sends him following a growing criminal empire that spans Bollywood, city business interests, and maybe even his own Police Department. Part of that pursuit intertwines his fate with that of Ganesh Gaitonde (Nawazuddin Siddiqui), one of the city’s biggest organized crime bosses. As Sartaj follows the trail of evidence that Gaitonde leaves behind (even after being instructed to back off the case), a series of flashbacks charts Gaitonde’s rise from a troubled childhood as he challenges the existing criminal and political elite. In splitting up the stories from different decades (Gaitonde’s ascendance progresses year by year through the mid-’80s, while Sartaj tries to sift through his eventual empire in the present day), “Sacred Games” gets to have it both ways. Sartaj, along with help from foreign intelligence agent Anjali Mathur (Radhika Apte) gets to deliver on those looking for a textbook cat-and-mouse criminal investigation. 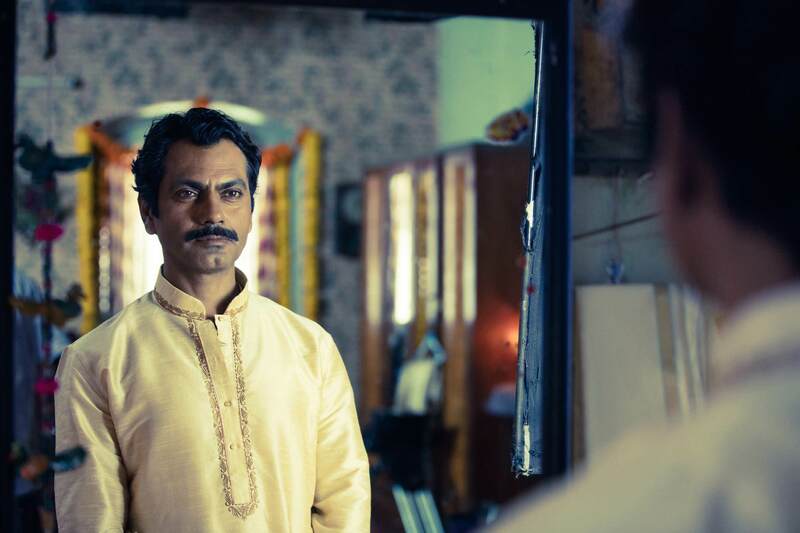 Witnessing the slow evolution of Gaitonde, it adheres to many of the usual rhythms of a mob origin story. Neither of these strands are revolutionary in their approach. But there is a visual craftsmanship on display that distinguishes “Sacred Games” from merely following in similar stories’ footsteps. Directors Anurag Kashyap and Vikramaditya Motwane understand the value of silence in these stories, building up to some tense standoffs with a lurking camera that finds new ways to capture the developments in Sartaj’s hunt. If the script indulges in the usual gangster story checklist (bloody rivalries fought over a woman, out-of-nowhere attacks in a restaurant, bold proclamations from crime bosses that they’re bigger than the city they run), there’s a fluidity with which Kashyap and Motwane convey the unrelenting savagery of what stems from it. Gaitonde’s flashbacks also come with interspersed with small history lessons giving his journeys context within the greater history of the country. Amidst the bloody back-and-forth between corrupt officials and corrupt businessmen, there are some occasional moments of levity, mostly involving Sartaj’s associate Katekar (Jitendra Joshi). Occasionally, “Sacred Games” also zeroes in on the idea that small moments can help set in motion tectonic changes. One chicken bone can start a riot. One phone call can scramble the lives and efforts of an entire department. One act of defiance can be the stepping stone to a new level of control within an impossibly volatile ecosystem. But none of these formal touches manage to lift “Sacred Games” from the overbearing violence (both psychological and physical) that permeates nearly every other frame of the series. Removing much of the tension as to who will come out on top of this elongated dance between police and criminal, the main lesson of Sartaj’s pursuit is that everyone seems expendable, including the guy pulling all the narrative strings. The series’ massive body count, which increases exponentially the higher Gaitonde’s ambitions reach, effectively deadens the individual weight that each successive death has. There’s a certain inevitability that even the characters afforded a backstory will one day find themselves in a pool of blood like the ill-fated canine in the series’ prologue. “Sacred Games” is the kind of series where it’s not enough for someone to die by an assassin sniper fire; they have to get run over by a truck afterward. The series teases the expansion of Gaitonde’s web into greater political and cultural arenas, but a majority of this series is people in pursuit of power trading body blows. That’s the backbone of “Sacred Games,” a show that manages to display something massive and sprawling, even without the emotional tether at its center that would add another layer to this bloodshed. It’s a crime epic that wants to consider what the police in a giant city owe to those they serve and the consequences of a cutthroat reputation built on dispatching any challengers at any moment. But these get passing glances in a tale that’s as expansive as Gaitonde’s aims. There’s beauty in the way that all of this sinister intrigue is conveyed, but it’s a surface-level telling of a story that wants to have so much more in its grasp. “Sacred Games” is now available to stream on Netflix. India vs England: Rohit Sharma Dedicates Century To His "Fallen Friend Sudan"